To do healing work, we need to learn how to modulate our brain waves at will, and fairly rapidly. Beta is a spiky and rapid brain wave denoting wakefulness, alertness, eyes open and active thought process. We need no practice in this! At the beginning of a session we need to utilize the beta brain wave state to interact with our client, to do a mindful evaluation and to make a session plan. What we do need to practice is being able to move back and forth smoothly between beta and alpha brain wave states. In order to practice this beta/alpha transition, we first need to become more familiar with the different alpha brain wave states. Alpha is a slower, more even brain wave which occurs when thinking is calmed, allowing the brain to function more slowly. Alpha denotes a range of brain wave speeds. As soon as we close our eyes and attend to our breathing we begin to drop from beta into alpha. This makes it very easy to practice moving from beta to alpha. Deliberately think in an analytical way and then interrupt the analytical thinking by closing your eyes and consciously breathing in and out for about a minute. Then, open your eyes and continue your analytical thinking. A good thinking topic for this, would be making a shopping list. Choose your topic to think about – a topic involving a list or a plan. Actively think on this topic for a minute,* perhaps even making notes. Close your eyes and breathe consciously for a minute. Return to your thought process for the next minute. Return to your thought process. Did interrupting the task to go into alpha brain waves alter your thinking in any way? Did your thinking on the topic become stronger or weaker? Did you get any surprising ideas? *Don’t use a timer for timing “the minute,” because the noise of the timer going off will startle you. A “startle” is a physiological reflex that occurs before you can consciously intervene, so it is no use thinking that you will be OK because you know what the timer means. The startle will put you in a completely different physiological state, cut across the effect that you are working toward. This exercise is not a time sensitive baking recipe – just estimate your timing. In any case, it is useful to learn a sense of timing even when in an alpha state, because that is the skill we need to manage the time aspect of a healing session. Meditation requires an even slower alpha brain wave state. We learn to meditate by learning to “empty” our minds of thoughts that create a “hopping and skipping” effect. There is a tendency to think that successful meditation requires an “all or nothing” standard – a completely empty mind – this is not correct. As long as we do not let the inevitable trickle of thoughts divert us back into active thought process, we are meditating successfully. In the beginning of meditation practice it is very helpful to use aids to help slow the brain waves. The simplest, and perhaps most effective, is to follow your breath, and deliberately slow your breathing. To slow your breathing, allow yourself to pause between breathing in and breathing out, and allow yourself to pause for even longer, as long as possible, between breathing out and breathing in again. The longer you can wait between breathing out and breathing in, the more calm and focused your entire being will become. Other aids to achieving a meditative brain wave state include watching the ocean, or listening to the sound of waves (a recording is equally effective,) watching a candle flame, watching the minute hand of a clock, and listening to appropriate meditation music. There are many possible aids, including excellent guided meditations. Exercise: What kind of meditation practice works for me? Choose 3 – 4 different meditation techniques that appeal to you, to explore. Am I beginning to recognize when I am in alpha brain wave state? Can I recognize when I am not in alpha brain wave state? What do I experience as the differences? Contemplation is also done in an alpha brain wave state. The difference between contemplation and active thought process (beta) is that in contemplation the mind is not jumping around in a jerky manner, but enjoying a sense of flow. If we use the analogy of the ocean, an “empty” mind is equivalent to a flat, still ocean, whereas a contemplative mind is like floating on a calm ocean at high tide – large swells lift and carry us in a supportive manner – and we allow ourselves to drift gently through the contemplation. As I write this, I realize that when I talk about “being in the zone” and “attuning to my clients,” I am actually contemplating their electromagnetic waves, allowing myself to “float” on their energy and that is how I am able to sense what is going on with them and what they need. In this state, I am allowing images, thoughts and feelings to come to me, and these give me exactly the information and insights that I need to help my clients. Visualization is the third brain wave skill that requires an alpha brain wave state. A claim that I have repeatedly heard from students is: “I can’t visualize.” I must admit that I have been totally puzzled by this claim, because as far as I can tell, everyone can visualize. It is so easy, and it is easy because it is such an ordinary and daily brain function that we don’t even know when we’re doing it. For example, if you have completed your errands and want to return to your car, you automatically visualize where you parked your car – and then you go there. Then, in order to drive home, you begin by automatically visualizing your route, and that helps you choose which exit out of the parking lot to use, and which way to turn. Sometimes, when we’re tense and rushed, our minds become overactive, and we can’t calm the beta waves enough to reach alpha. We find ourselves unable to “remember” where we parked the car – that is a moment when we can’t visualize. However, when we are able to calm ourselves sufficiently, and our brain waves slow, we do remember, as the necessary images become accessible again. Visualization is very important in healing work and we need to learn how to generate visual images. This also connects us back to “intention” skills. If I am working to reduce inflammation, I visualize the redness of the inflammation being infused with green light. I keep on going until I can visualize the redness being quenched and the tissue being suffused with green. If the green sustains even after I stop generating the green light image, I have learned that that means the procedure is complete. We also need to learn how to receive visual images. Unfortunately, the act of trying is a beta brain wave state, and the reception of visual images is an alpha brain wave state, so somehow, we have to learn this skill without trying. The key is to practice patiently without expectation and without judgment. Allow yourself to drift quietly in an alpha brain wave state whilst working on a client, and gradually the visual images will just come to you, becoming more and more detailed. Another key is not to compare yourself to others. Everyone has different strengths, and different standards for evaluating herself. People also use words differently. In every class that I teach I see at least one person who is self-reporting poor performance when she is actually doing better than someone else who is self-reporting success. This is not to say that the lesser performance is not successful – my point is that self-reports are not usually particularly accurate, coming more from psychological make-up than from objective information. The bottom line is: Pay attention to your own experiences and stop worrying that you aren’t as good as someone else. An even more counterproductive behavior is trying to “be the best.” Skill-learning is not a competitive endeavor. Everyone goes at her own pace. If you are interested you will learn how – these are all natural human capacities and if you are human, you CAN do it and best of all – time is on your side. Imagine that you are going to eat a lemon. First, picture the yellow lemon on the table in front of you. Pick it up and smell it. Lemon has such a particular fragrance, doesn’t it? Now, imagine a board and a knife. Place the lemon on the board in front of you, and cut the lemon into quarters. Pick up one of the quarters and bite into it. Did you feel your mouth pucker involuntarily at the sourness? This is one indicator of success. I have yet to meet a student who cannot do the lemon visualization successfully. If you were able to do the visualization at the same time as reading the steps, you are already on your way to being able to move seamlessly between brain wave states, because reading is one brain wave function and visualization is another. If the alpha brain wave slows down even more, one enters a theta brain wave state. This is the brain wave state that you want to induce in the client to make them most susceptible to healing input. In theta, time perception changes, the eyes usually close involuntarily, breathing becomes slower, the forearms can feel numb, and the ability to speak can become somewhat suppressed. The reason speech is suppressed is because imagery supplants words. Clients in theta often report seeing colors and images – the equivalent of dreaming when asleep, but theta is not quite a sleeping state. It is important to note that although the majority of people will have their eyes closed in a theta state, open eyes are not a definitive sign that the client is NOT in theta. Nor is the ability to talk a definitive sign that the client is not in theta. Some clients will keep their eyes open, and converse, throughout a session, even whilst they are in theta. An altered sense of time is a more definitive indicator of an altered state of consciousness. Over the years, I have learned to ask clients, towards the end of the session, how long it feels like they have been on the table. 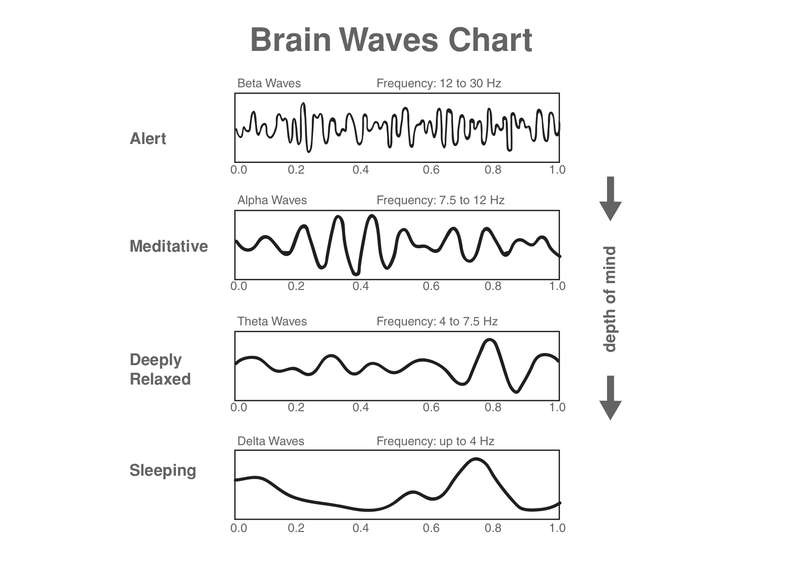 As the theta brain waves slow down even more, the client can fall asleep –indicating a delta brain wave state. Usually clients will sleep for only a few minutes at a time in a healing session. These few minutes are very refreshing and do not interfere with the efficacy of the healing session. However, it is not constructive for a client to sleep deeply throughout a healing session. A session does need to engage some conscious interaction with the client, awareness of what is going on and interaction with the healing input. The ideal brain wave state for the client is a proportion of alpha brain wave state and a proportion of theta. The one exception is during a Crystal Surgery session, especially if it is to prepare for a physical surgery. In this instance, as soon as the session begins, 90% of clients simply “fall asleep” as though they have received an anesthetic. I have observed this over and over again, and I am not entirely certain what brain wave state is in action. It could be a form of hypnosis, because clients report “feeling everything” (in a good way) even though they appear to be asleep, even exhibiting REM (rapid eye movements,) an indicator of dreaming whilst asleep. The only way to discover which brain wave form is dominating would be to investigate with modern technology – something I hope to be able to do at some point in the future.